We provide up to a 10-year warranty on our floor coatings. Warranty periods are based on commercial or residential applications, the environmental conditions of the project and the type of concrete system selected. Regardless of whether your new Cutting Edge Decorative Concrete floor will be installed in a commercial or residential environment, there are a few things to take into consideration in order to ensure optimal performance and enjoyment. What type of surface will we be coating? Is it concrete, steel or wood? Is the surface suitable for coating and the environmental exposure? What type of surface prep will be required? What type of performance characteristics will the coating be exposed to? Aesthetics play a big role. High-performance, polyaspartic coatings are the most UV stable. Expect to pay more for better performance. Will odor be a concern in or around the application area? Some resinous coatings have a very low odor while others have a stronger odor that dissipates when ventilated. Quality jobs take an average of two to three days to install. Can your space be at our disposal during that time? 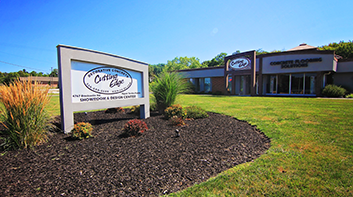 Our passion for the epoxy floor coating process can only be fully appreciated during a visit to our Richfield, Ohio-based showroom. 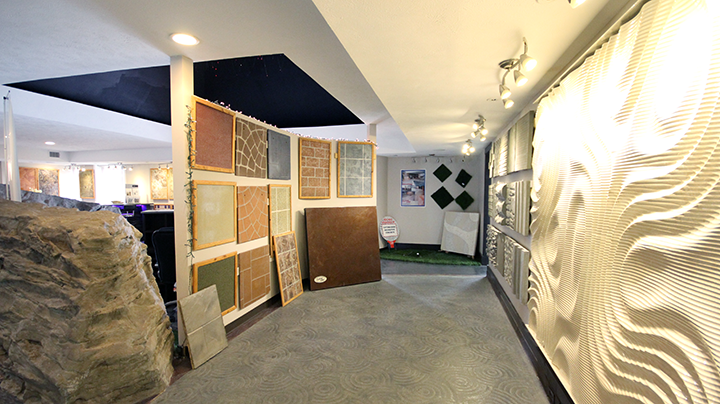 In fact, our showroom is like nothing you’ve ever seen before. Get a real feel for what’s possible when you tour real-world installations of dozens of different color choices, coating options and out-of-the-box applications. It makes the possibilities dramatically come to life, and helps to make clear the concrete floor coating process. You know your home or business best, that’s why we invite you to sit down with one of our floor coating experts to choose the color(s) and application that make the most sense for you and your budget. Take advantage of our Instant Pricing Program. Bring in your rough measurements and photos of your space and we’ll reward you with a 10% discount. You’ll get a price quote for your job—on the spot—and you can also opt for our guaranteed start time. Ask for details when you visit the showroom.